The moment I started college, I wanted to document my experiences growing up, how it’s like living miles away from home, experiencing things for the first time and everything I do as a college student. I knew that it was a new chapter of my life and documenting it will be memorable and fun. I have been keeping journals since I was 16 years old. I write every day, 365 days a year. No misses. I’m not quite sure why I like to write. I don’t like the subject English, my grammar is not good, my vocabulary is not as wide as others, and I often misspell the words I write. But still, I keep writing. Because I don’t like dead stories. Like what they say, It’s better to tell it to yourself than not telling anyone at all. Otherwise, it would be a story that has never been told. I said it before on my very first post in this blog that I like to share things including my thought. Whatever it is. So here’s what I thought. In today’s generation they say that blog is the new journal for every millennial. I believe this is true. It is a great way to share your own unique stories and maybe, you might inspire other people through blogging. Never did I know that from this, I could find jobs online or remote jobs that can help me earn money. Like applying for a job, you need a resume. Your blog can be that resume (a better version of it if you ask me). For example, if you’re writer, you can put all your write ups in your blog. If you’re a photographer, your blog will be your exhibit of your best shots. If you want to be a virtual assistant, having a blog can teach you a lot of things such as managing a website, social media marketing, and SEO knowledge. These things can help you land a job in the future. As for me, my blog is where I put my creative activities that I enjoy doing such as writing, photography, and video making. It is also a way to improve my marketing skills using social media. Always make sure that your blog can show your skills and things you can do. We all know that we search everything online. Recruiters will investigate you online too. Your clients can see your online presence and what have you done so far. For example, I have this client and she checked out my blog, my YouTube channel, and Facebook Page before she hired me as a Social Media Assistant. That’s why having a website or a blog is great way to show your personality and your professional traits. You can control what content you can show in your blog and make sure that your contents align with what you do or what you can do for your future clients. In blogging you can connect with your readers, fellow bloggers, digital nomads and even future clients. Having a good amount of connections can lead you to a lot of things, including having a remote work. It is also good that you attend events, or join an organization to help you make your blog better and to make your connection wider. In my case, I have friends who blog as well and gave me some online jobs. You can even get some jobs from your friends too. Connections do matter in digital world and in the real world. For me, I treat my blog as my personal brand, my business (not earning much though. HAHAHA). I treat my blog with pride. Your blog is more than a place where you can put anything you like. It is a place where you put your personal thoughts, visual and intellectual creativity. It is a part of you! I just want to let you know that it will not come fast as you want it to be. It is better to make a blog that you enjoy doing and everything will just follow (including earning money from it and having an online job with the help of it) as long as it is your passion and you put all your efforts into it. I want you to start a blog. Yes you! Since you’re reading this post you may want to start a blog but maybe you don’t know how, or you just need a little push to do that. Don’t worry. I will help you with that. Here’s a quick guide on how to start a blog. It might be about travel, lifestyle, photography. Maybe a mix of everything. No matter what you want to write, you should pick a niche in order to attract the right audience. If you have a very specific topic, that would be great since it will be unique. This is important if you want your blog to be known. Before I settled on a travel blog where I share my crazy adventures and silly misadventures, I started sharing about myself, what I was doing, and what I was thinking. I didn’t care if anyone was reading it. I was just simply sharing my own story. Do not be afraid to do the same. Always remember that you should be passionate about what you blog about. You can always share anything under the sun as long as long as it true, good, and helpful. This is the most difficult step ever. Brainstorming for a blog name is very challenging. This is because you should treat your blog name as your brand, regarding on what kind of niche you will choose. Your blog name should represent you and what you will blog about. Avoid creating a blog name with a lot of words like “Trip around the world with [Name]. It is hard to remember. It will be also good if it will stand out from the rest. Do not copy other people’s blog name especially when they are already well established. Like Nomadic [name], and Adventurous [name]. Most likely, your name will not be remembered. I know names are unique and it represents who you are. BUT. If you can avoid it. Kindly do not add your name to your blog name. Like mentioned earlier. Remember that you need to create a brand. However, if you really want to include your name. I’m not judging you. I’m just giving you a simple advice. Also please avoid using numbers and hyphens since it will be difficult to write and to remember. Do not put a limit- Think long term. Do not limit your blog name with a specific time, number and place. It should be timeless and without boundary. Do not name your blog “A year of travel” when you are planning to travel more than a year. Do not name your blog “College traveler” when you will eventually graduate and will still continue to travel after college. 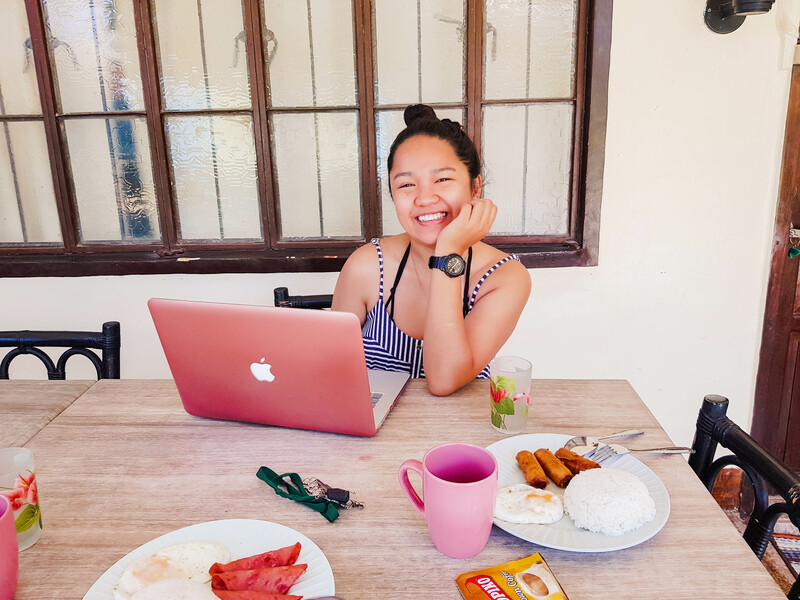 If you want to create a travel blog and you’re from the Philippines. Do not name your blog “My Philippines Travel” when there is a possibility you’ll write about your travels in other countries. Check if it is available- It is good to check if your name is available. Do not forget to do your research. Go to Siteground to check if your domain is still available. Check also if it is available across social media. You can visit KnowEm.com for that. How did I get my blog’s name? I was trying to pick a name for my blog and asked a friend if it sounded okay or if it fit my personality. Every suggestion that I gave her was not good enough. Since she kept on telling me that I’m fickle-minded. I sarcastically said, ‘I guess I have to name my blog fickle-minded’ then she suddenly said with a big smile ‘The Fickle Feet’. And so the fickle feet it is. I’ve been using WordPress since 2012. I started from wordpress.com which is a free platform. This is really good for beginners because you do not have to pay for hosting. However, you have limited options of plug-ins, themes, and other ways to customize your blog. And, your website address will be yourblogname.wordpress.com. If you want to monetize your blog in the future. It should look professional. This is the reason why you should buy your web domain and web host which you can get in Siteground. Web Domain– Is the name of your site. For example, my domain is theficklefeet.com. Web Host– Is a service you need to avail in order to have a space in the internet. NOTE: If you choose to blog with the free platform WordPress.com, and you will decide to buy a hosting in Siteground later on, you can easily import your posts to your new domain. Just contact them and they will help you. Very affordable price and quality hosting- For almost 2 years with Siteground, I never had any problem. They have the best security protocols, and a tons of free options to make your website better. And what I love is they are also offer affordable price for beginners. For basic plan in SiteGround, it can only cost $3.95 (Php 175+) per month! Beginner-friendly- Their interface is easy to access especially for beginners. Additionally, they have a large resources on how-tos that are very easy to understand. Amazing customer service- I love their customer service. They have a 24/7 Live Chat’ feature which I always use if I have questions. Very accessible and fast. You can just ask them anything and they will really be happy to assist you. 1.CHOOSE PLAN – Go to Siteground and sign up through this link. It will give you up to 60% discount off the regular price! Then pick a plan. For beginners you can choose the ‘StartUp‘ plan that costs $3.95 (Php 175+) per month. There’s always an option to upgrade to ‘GrowBig‘ and ‘GoGeek‘ later on. Then click the ‘Get Started‘ button. NOTE: Regarding the ‘period’. This is the mistake I did. I did not choose the maximum plan. So if you have enough money to spend, I suggest that you go for the 36-month option where you can enjoy the 60% discount. Also, You can order the Domain Privacy and HackAlert Monitoring to secure your website better. After purchasing your domain and hosting, you will receive an e-mail notification confirming your registration with SiteGround. It means that you already set up your hosting account. There will also be a separate email that will give you the username and password details. In each of these emails there will be a ‘My Accounts’ link where you can log in. You can also go directly to Siteground to log in. P.S. When I purchased my hosting, I didn’t receive the email immediately. I asked their customer service and they helped me have it quickly. You can always contact them if you have any problem. For installing wordpress, you can check this step by step guide from Siteground. If you do not know how to use wordpress yet, you can check this link for tutorials. This is the fun part. You can customize your blog according to what you want with it. You can get a lot of free themes on WordPress. First, you can go to your WordPress Dashboard. On the left side, click ‘Appearance > Themes > Add New’ and a list of free themes that you can install for your blog. You can also search a lot of free and premium themes on the internet. I got mine from easy blog themes. You can check Creative Market and Elegant Themes. Since your blog is your brand, a logo or header should represent it. It is very important in the long run. But you can create this when alredy you have an establish blog. However, it is also a good practice to have it in the early stage. Canva – the best easy way to create a lot of banners in social media. Also to create your header and logo. You can just sign up and then you can play around with it. Fiverr – If you are not confident enough to make your won. There are a lot of graphic designers with affordable rate that can help you create your banner. You can also check creative market logos. Ask a friend – The Fickle Feet’s header and logo is created by my friend. Since I believe that friends should support one another, I paid for it wholeheartedly. You can also do the same. WordPress SEO by Yoast – This is a must. It helps optimize your google ranking. It helps you manage your SEO. Akismet – Comments spam is really annoying and this plugin helps to protect your website from that. Jetpack – This plugin offers a lot of features, such as Site Stats, top views and Related Posts. Contact Form – This will add a form to your contact page so that people can email you. About Page– It is one of the most visited page in your blog in the future. It is because new visitors will always check the about page. It is important that you put what is your blog about and who is the author of the blog a.k.a about you. Contact– Where you can be contacted. You can add here the plugin I mentioned earlier the Contact Form. You can also add your social media accounts. Disclaimer/ Term of Use/ Private Policy– To protect your rights as a blogger. It is also important if you want to apply for monetization in the future. Others – You can add other pages in the future as your blog grows. About – It shows a brief sentence about you. Make sure to add your photo. Social Media Links – This is a great way to promote your social media accounts. Popular Posts – To show your popular articles that your blog’s visitors might want to read as well. Newsletter – This is for people who want to subscribe to your updates. You can create an email list in MailChimp. Like mentioned above, an email list is important. People who subscribe to your email list are your most avid readers. In the email list, you can send updates, contests, giveaways or even products you want to promote. Most popular is Mailchimp which has a FREE with a maximum number of 2,000 subscribers. Awebener – With a free 30 day trial. It is important to secure your usernames. Make your username is the same as your blog’s domain. For example like mine @theficklefeet. I am happy that my social media have the same usernames. But, in case someone already has your username. Make sure to make one almost the same for example @the_ficklefeet. Social Media is also a great way to promote you blog contents. So make sure to grow your following. Always remember that quality is always better than quantity – Always make it something valuable and meaningful. Try to post regularly – Some bloggers post at least 3 times a week or even everyday. Others only post on a specific day like every Friday. But for me, I try to post at least once a week. Don’t be to hard on your self if you can’t post regularly, eventually you can find your own rhythm. Learn and Read other blogs – Blogging has tons of skills to grow. May it be your writing skills, how to promote your blog post on social media, google rankings, and a lot of skills that you’ll need to run a successful blog in the future. Always find time to be curious and learn. Engaging – Create contents that would let your readers to be engaged. A good way to do this is to let yourself open up and let your readers know you well. May it be a conversational, or a dare that can be a challenge to someone. Let your imagination explore the possibility, and let your personality shine. Helpful – Helping and giving useful ideas is also the best way to attract readers. We all want something in return, and readers might stumble upon your blog because you give them something beneficial. Honest – Be authentic to your own truth. Give the correct facts. Let the world know about your blog post. Sharing it just simply means “Hey, I have a post that you might want to read”. This is a good way to find readers and promote your blog. Social Media – Best and easiest way to attract readers is via social media especially in Facebook and Pinterest. Contributions or Guest Post– You can contribute to other bloggers post. It is a great way to connect with them and to have your blog be heard by their audience. Or else, you can write to other publications like Thought Catalog. If you are a travel blogger, you can write to Matador Network. Join a community or a Facebook group – Having a community that will support and help you promote your content is really helpful. If you’re a travel blog this post of Facebook Groups is really helpful. If you’re from Cebu, you can join Cebu Blogging Community, or Cebu Content Creators. Hope this post can help you take the leap to start your blog and share your own unique stories to everyone! Feel free to comment and ask in the comment box below if you have any questions. I will try my best to answer them. You can also email me at roneth@theficklefeet.com! Disclaimer: Some of the links in this post does contain affiliate links that I earn a small commission for, but they come at NO extra cost to you! Any purchases you make through my links help keep the site running (and help me feed to survive 😀 ). Still and the same, like I’ve mentioned above, I only recommend brands that I personally use or believe in. Thanks in advance for your support!